So over the weekend it tried to snow. If you check out my vlog HERE - you can see I managed to get some footage of the weak attempt at snow we got. 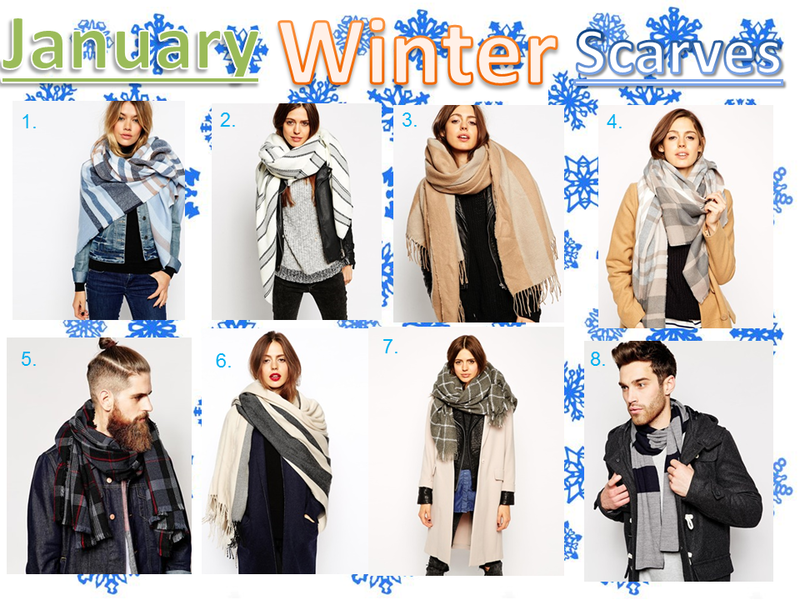 So that added with the freezing mornings we are experiencing at the moment (I got up for work today and it was -5) I thought I'd do a little post on scarves to keep us all warm. Some people might think this is a post for November/December time - but I don't live by the rules. Before Christmas I spent hours and probably days searching for my 'winter scarf' which I do every year - which is a scarf that I wear all winter when its cold. I found this really amazing scarf which was massive and so warm and only cost me £20. I spent ages searching different stores online and ended up looking through ASOS's large collection of scarves (I mean seriously there are thousands). As you can see with my choices 'oversized' scarves are a popular choice at the moment. I really like them because you can use them even when your inside as a small blanket (obviously not a first choice in its use) but I really love them. I've also added a selection of woman's and man's scarves as I don't see why a guy can't wear a woman's scarf or vice versa.